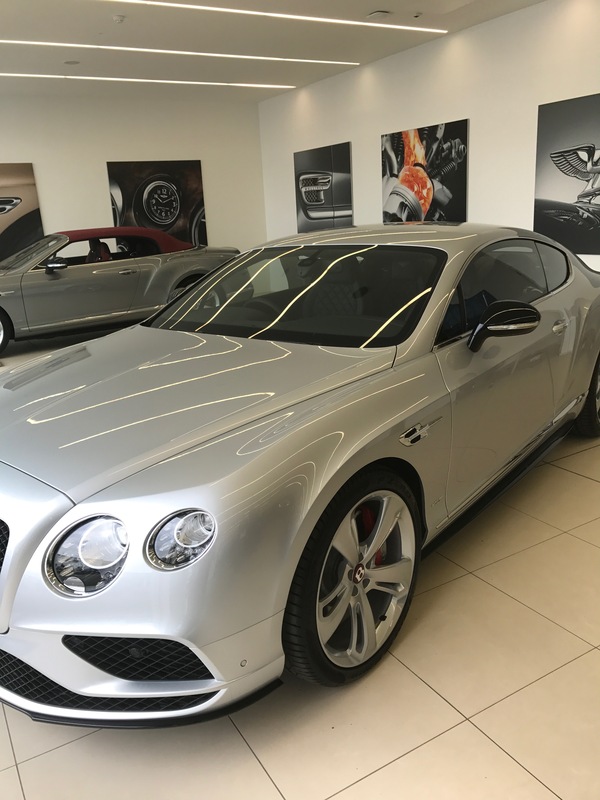 REASONS TO BE CHEERFUL, 1,2,3…..
It’s been a good week for me. I picked up my new car on Saturday. 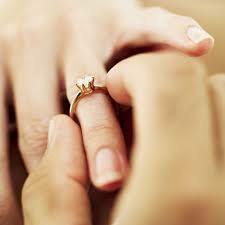 My daughter got engaged on Sunday. Looks like she will get married on … Elvis Costello’s birthday. That’s a two-for deal! 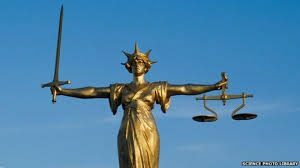 And today, the High Court dispensed justice to a social network troll who has spent years harrassing me, posting abuse and menacing tweets. A victory for common sense and a great relief to me. Not a bad few days all things considered! 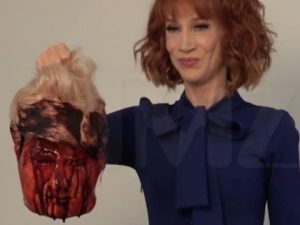 Yes, Kathy Griffin went too far. Yes, Kathy Griffin has apologised. Yes, CNN still want to keep her on. A fake comedienne on a fake news channel. Can you imagine the outrage had this been Obama’s head? When does Griffin go to prison? Former Governor John Sununu, a vocal critic of the Trump campaign and presidency, appears on CNN and completely takes apart the bullcrap narrative surrounding the ‘Vast-Russian-Conspiracy’ theory. Please take the time and enjoy a great interview. Major cringe but still worth a laugh. This is the wannabe Labour Prime Minister… glorious. These two would be PM and Home Secretary. It’s all a farce. Labour will lose HEAVILY in just over a week. For starters, the “hard Tory Brexit” will proceed as planned and there is literally NOTHING the pipsqueak SDLP will do to stop it. Second, the record of the past twenty odd years shows that constitutional nationalism has faded on the vine as that community embraces Sinn Fein/IRA. In 1998 the SDLP had 24 seats at Stormont, it now has 12 seats, a 50% decline. Like the UUP the SDLP is a victim of a polarised society – and the way I see it that party has nowhere to go. Third, there will be no border poll. Brexit is not the opportunity for Irish unity Eastwood imagines, it is the final nail in that political coffin. This graffiti image was posted on Twitter today. It is attributed to a republican part of Belfast. The celebration of the death of 22 “Brits”, eh? 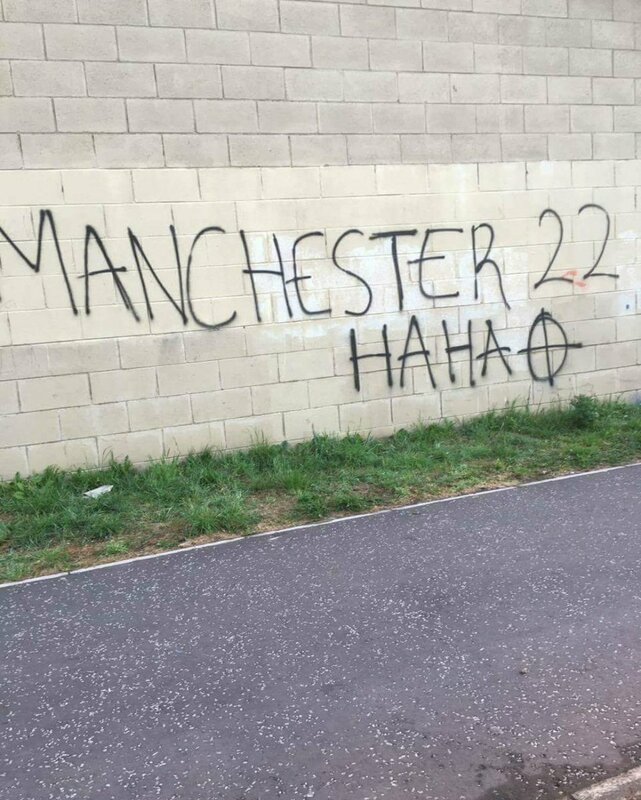 Whilst most decent people mourn the loss of life to a vile terrorist, some sick individuals relish it. I am currently looking to identify the precise location of this. 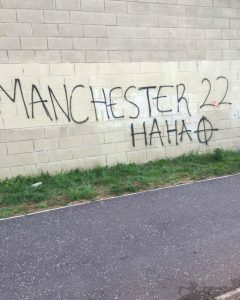 I fully accept that the majority of people in republican areas of Belfast would find this abhorrent but clearly, not all. That in itself is a worry. The mainstream media likes to run a narrative. Last year it tried two particular narratives which both backfired spectacularly. We were told that the UK would reject Brexit as being just too dangerous and would vote to Remain. They called that one wrong. We were told that Hillary Clinton was a shoo-in to the White House. Boy did THAT backfire on them. 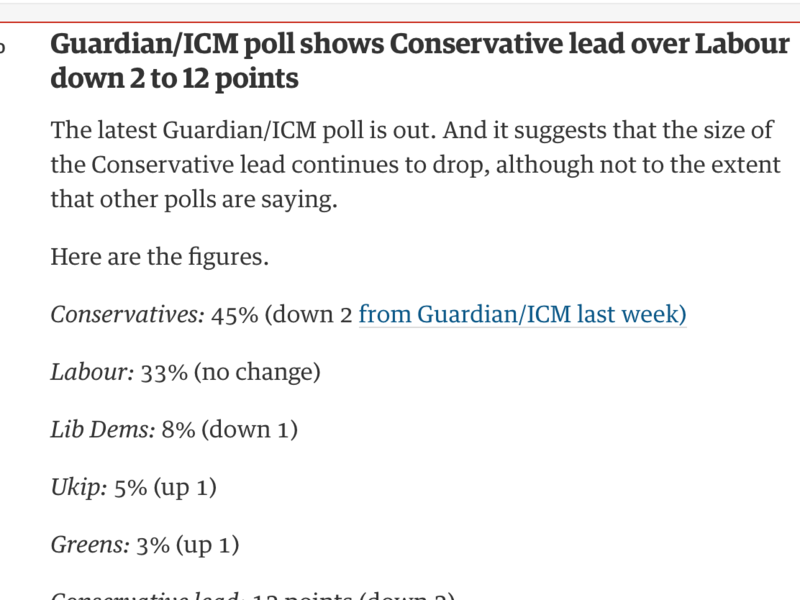 And the new narrative is that in this surprise UK General Election, Labour are closing the gap on the Conservatives, that people like Corbyn the more they see him, and that it is even possible we might get a hung Parliament. This is specious nonsense – but it’s aimed at keeping us glued to the mainstream TV tiresome “coverage” – i.e. all about ratings. 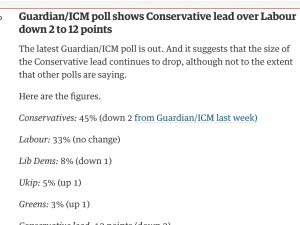 The Guardian, the useless bankrupt organ of the left, gushes that Labour have cut the Conservative lead to a mere 12 points! Here are their latest numbers. So Labour will LOSE dozens of seats and THIS is a “too close to call” race? Corbyn is on the up with the public as they prepare to deliver a devasting verdict on his leadership? You are being misled by our phony media yet again. That’s why more and more people are using other media platforms to gather knowledge and opinion. In that regards, my little Youtube defending Katie Hopkins has had 73,000 views in the past few days – people are moving away from the lying media and, with many others, I come to bury it. In the aftermath of the carnage of the Manchester Arena jihad attack, which took the lives of 22 people, there was some media focus on the local Mosque where the killer worshipped. Naturally the media angle was that the Mosque was a place of prayeful innocence that had NO IDEA how the killer could have become so radicalised. THE mosque where bomber Salman Abedi ­worshipped hosted hate preachers who called for British soldiers to be killed and gays and adulterers to be stoned to death. Didsbury Mosque’s YouTube channel still features videos from clerics including American Abdullah Hakim Quick. He called for homosexuals to be killed and death for those who do not follow Islam. Right. So apart from providing a pulpit for hate preachers espousing the most vile views, Didsbury mosque is a charming resource for the local muslim community. The sad part of the probe of Jared Kushner is that it will detract from his speed in brokering a deal to bring peace to the Middle East. In a family of Fredos Jared seemed to be, well, the white sheep. Like the President he is the son of a notorious real estate titan, and that probably helped forge a bound. Although he had no foreign policy or diplomatic experience he seems to have been given Trump’s ear on these issues. And there are few people Trump listens to, not counting the voices in his head. The irony is that Trump got to where he is by screwing other people and Kushner got to where he is by screwing a Trump. It seems amateur night in Dixie to have meetings with Russian diplomats and bankers as Kushner appears to have done. Also, the Russian goal is not necessarily effective collusion, but effective confusion. If they can sow discord then their work is done. I am not sure he did anything illegal if he merely discussed back door channels, but he sure did something dumb. It wouldn’t hurt the Trump clan if they ran some things by some professionals from time to time. Otherwise the country will continue to have chaos at the top, and the Trump’s will have an awkward Thanksgiving. The other day in Oregon, three men rose to the aid of two girls who were the subject racial/religious abuse. 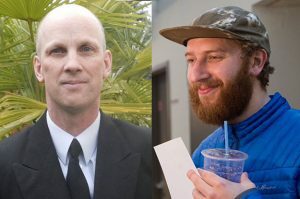 Two of these three great men were stabbed to death. Micah David-Cole Fletcher, who also aided the girls, is expected to make a full recovery. These men were/are the best of us. Let us always remember them.